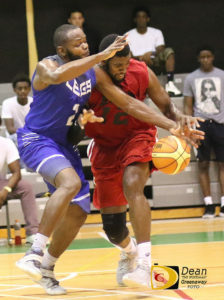 The biggest game of the 2017 BVI Basketball Federation season between unbeaten Legs and the Virgin Gorda Mystics that attracted the season’s largest turnout to the Multipurpose Sports Complex on Saturday night, was called off at 10:45 p.m. when referees failed to show to call the game, much to the disappointment of players and fans. Legs, at 4-0 and the Mystics at 3-0, were meeting for the first time and attracted fans from Virgin Gorda and throughout Tortola. Smith said they were looking forward to the game particularly because Steve Parillon and Killven are on the Mystics. Parillon expressed his displeasure with the turn of events. Kyra Powell said she was looking for a really good game between unbeaten teams. In a statement issued by the BVI Basketball Federation on Sunday, they sincerely apologized for the cancellation of game three on Saturday night. It was the second embarrassment of the season for the BVI Basketball Federation. On opening night, the game between the Mystics and Latinos was called off with 9:32 left in the second quarter, after the Latinos’ Ruben Reyes was ejected from the game, then triggered a mass brawl after after a fan said something to him. The Federation has banned Reyes from all basketball related activities in the BVI. In games that were played, East Rockers Mikey Joseph had 34 points to lead East Rockers past the Starz, 101-60. They also used a 25 points 10 rebounds double double by Leslie Smith, to turn back the Maga Guns, 84-80. Maga Guns turned to Douron Phillips for 28 points and 16 boards in whipping Go Hard, 104-91. The Latinos had 17 points from Ryan Alfred and 16 and 12 rebounds from Juan Richards to get their first win of the season, and 85-77 triumph over the Starz.